The OS685 model has been discontinued. 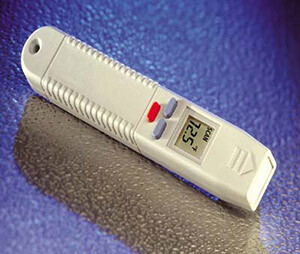 Please see the OS-PEN9 model as a possible alternative or contact our Temperature Engineering department. The ultra compact OS685 has been specifically designed to fit into your pocket, just like a pen, so that you can carry it with you anywhere you go. You simply aim, press the SCAN button and read the temperature immediately. No fuss. No need to focus and no special training. The OS685 is particularly useful for test, inspection and maintenance applications in such diverse industries as food & beverage, automotive, plastics & rubber, textiles, paper & packaging, chemicals & pharmaceuticals, HVAC, electrical, asphalting, plus many others. Each unit comes with additional functions such as maximum, minimum and average temperature measurements. It can be LOCKED into the ON position if continuous measurements are required. The last measured value can also be held for those situations where it is not easy to see the display while measuring. 참고: Each unit supplied with 2 x AAA alkaline batteries and complete operator's manual. The OS685U includes a cable with a USB connector, and software compatible with Windows (versions 95 to 7), which offers analog display, trend graph, data logging at intervals from 1 second upwards, sensor configuration and tab-delimited store file.